Figure 1. Jade table screen with landscape scene. Nephrite. Gift of Heber R. Bishop, 1902; photo courtesy of the Metropolitan Museum of Art. Hardstone carving is one of China’s oldest artistic traditions, dating back 8,000 years. 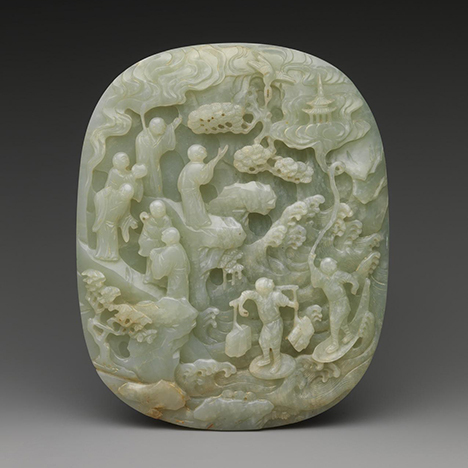 As the most highly revered stone in Chinese culture, jade was preferred but other hardstones were carved as well. Access to raw materials rose and fell as dynasties changed, and the carving techniques slowly progressed. During the Qing dynasty (1644–1911) it all came together: a dependable supply of raw material, exceptional artistry and craftsmanship, and enthusiastic imperial patronage―especially by the Qianlong Emperor (r. 1735–1799)―led to a profusion of remarkable carvings. Colors of the Universe at New York’s Metropolitan Museum of Art showcases 75 of the finest examples of Qing dynasty lapidary art, drawn from the museum’s impressive collection. In addition to jade (figure 1), there are exquisite carvings in agate, quartz, malachite, turquoise, amber, coral, lapis lazuli, and other hardstones. Filling all four walls of one large gallery room, as well as a double floor case in the center, these carvings illustrate the extraordinary imagination and technical virtuosity that was so highly appreciated by the Qing imperial court. Many, but not all, of these carvings are from the Heber R. Bishop Collection, a portion of which is on permanent view at the museum. Bishop, a noted sugar tycoon and philanthropist of the late 19th and early 20th centuries, was an early trustee of the museum who donated his remarkable collection of jade carvings to the Met in 1902. He also sponsored one of the very earliest books on jade in the English language, a massive pair of volumes weighing 125 pounds. Only 100 copies were printed, distributed exclusively to royalty and national libraries worldwide. One whole wall of the gallery is devoted to Bishop jades (except, oddly, for one). Here we see evidence of Heber Bishop’s unerring eye for superb carving. Favorites among this group include the large “Boulder with Daoist Paradise,” an example of yu shan or “jade mountain” and the even more massive “Jade Basin” (figure 2), modeled after the famous original in Beijing’s Beihai Park Imperial Garden, believed to have been commissioned in 1265 by Kublai Khan. The original is one of the most famous of all Chinese jades. In the mid-1700s the Qianlong Emperor recovered it from priests in a Daoist temple who were using it to store pickled vegetables. 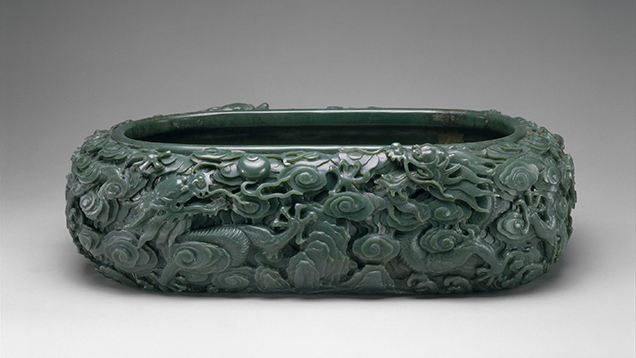 The emperor was so enthralled by this jade basin that he wrote three poems about it, had them inscribed inside, and erected a pavilion to display his treasure. Figure 2. “Jade Basin” ca. 1774. Nephrite. Gift of Heber R. Bishop, 1902; photo courtesy of the Metropolitan Museum of Art. 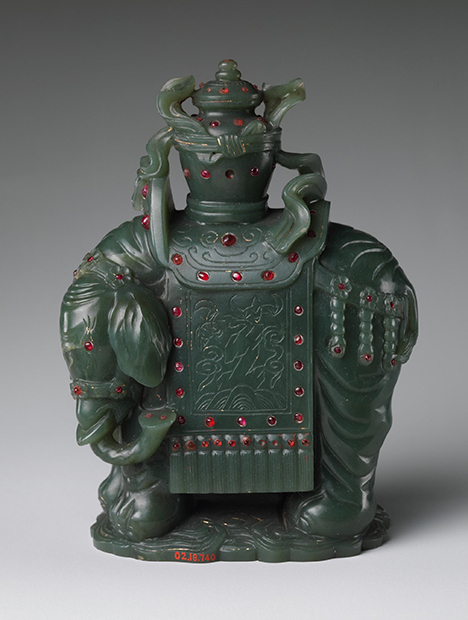 Figure 3.“Elephant Carrying a Vase.” Nephrite inlaid with garnet. Gift of Heber R. Bishop, 1902; photo courtesy of the Metropolitan Museum of Art. Figure 4. “Pomegranates.” Agate. Gift of Heber R. Bishop, 1902; photo courtesy of the Metropolitan Museum of Art. The double case in the center of the gallery features nine snuff bottles (mostly from the bequest of businessman Benjamin Altman) and 12 smaller hardstone carvings. Favorites include a rock crystal snuff bottle with tourmaline “hairs,” seen in figure 5; a jadeite snuff bottle with gorgeous apple-green color (both bottles left undecorated to best show off the material); a finely carved coral ruyi (or scepter); delicately carved pendants of jadeite and tourmaline; and a diminutive aquamarine seal (chop). Figure 5. 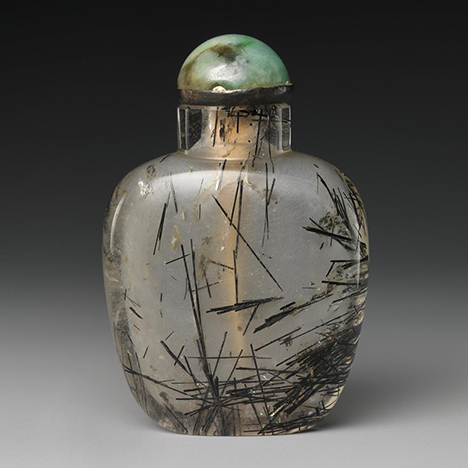 Tourmalinated rock crystal snuff bottle with jadeite stopper. Bequest of Benjamin Altman, 1913; photo courtesy of the Metropolitan Museum of Art. This exhibition affords the viewer a chance to compare similar kinds of stone. 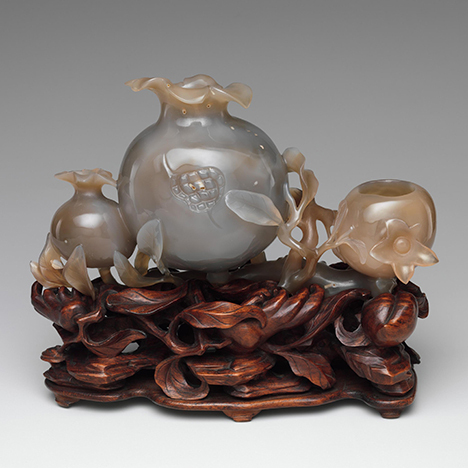 For example, several varieties of carved chalcedony and agate are displayed, as well as different types of jade, both nephrite and jadeite. 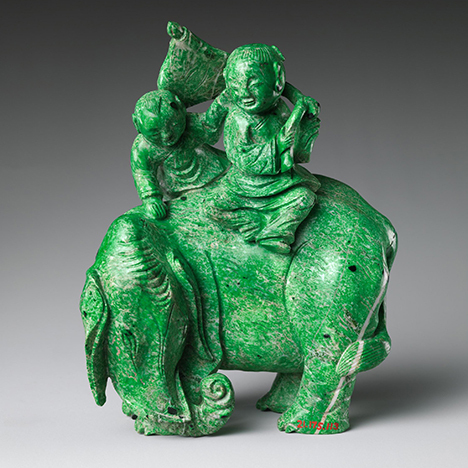 The kosmochlor jadeite “Elephant with Two Boys” (figure 6) offers a rare opportunity to see a large example of this unusual material, and the green chalcedony vase makes clear the difference between that humble stone and true jade of similar color. Figure 6. “Elephant and Two Boys.” Kosmochlor jadeitite. Bequest of Edmund C. Converse, 1921; photo courtesy of the Metropolitan Museum of Art. All the exhibits are well lighted and clearly labeled. It would have been interesting, though, to include a photograph or two of the carving of these masterpieces. In the Qing period these hard and tough stones would have been patiently hand-worked by slow abrasion on foot treadle powered lathes, making the artisanship all that more impressive. To spend a year or more carving a single piece would not have been unusual. This exhibition will appeal to all who are interested in lapidary masterpieces, Chinese decorative arts, unusual gem materials, and the very finest in craftsmanship. Gallery 222 is on the third floor; one way to reach it passes through the galleries of ancient Chinese jades; visitors should take that opportunity to see how Chinese hardstone carving began thousands of years ago. Finally, do not miss the opportunity to visit the museum’s Chinese Scholar’s Garden for yet another view into Chinese glyptic arts. Colors of the Universe: Chinese Hardstone Carvings will run at the Metropolitan Museum of Art’s Main Building on Fifth Avenue until October 9, 2017. The recommended admission is $25 for adults, $17 for seniors 65 and over, and $12 for students; this also allows same-day entry to the Cloisters and the Met Breuer. The Fifth Avenue building is open seven days a week; hours are 10:00–5:30 Sunday through Thursday, and 10:00–9:00 Friday and Saturday. The museum is closed the first Monday in May, Thanksgiving, Christmas, and New Year’s Day. Eric Hoffman is a retired aerospace engineer with a 45-year interest in Chinese jades. He is the proprietor of Hoffman’s Far East Gallery, specializing in jades and snuff bottles, and a contributing editor to Adornment magazine. Review of Spectaculaire Second Empire at the Orsay Museum in Paris. A review of Lustre: Pearling and Australia at the Immigration Museum in Melbourne. Review of Glitterati: Portraits and Jewelry from Colonial Latin America at the Denver Museum of Art.